We’re on the island of Terceira and today took a tour of the island by jeep; booked on a whim with Explorazores. Our group was made up with just two other companions; Hen and Nom from Israel who were great company throughout the day, and we were expertly guided by Mike. During the morning we drove through dense forest, scattered villages and lunched at the island’s no 1 restaurant, Ti Choa (as per Tripadvisor), which certainly lived up to its reputation. Fantastic food, a great little building (an old converted house) and lovely, friendly service. We got to sample regional wine, a lovely blackberry liqueur and some local brandy. Hic! 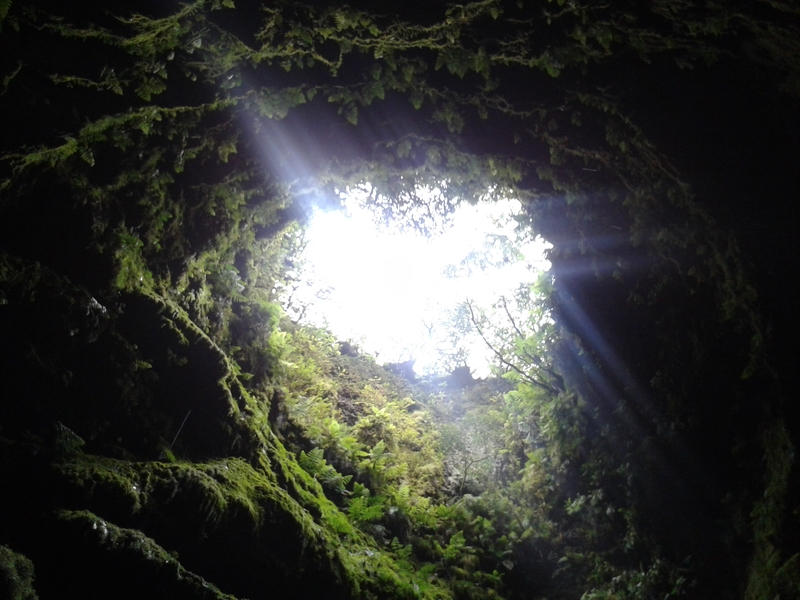 But the highlight after lunch was a stop at two of the island’s – and the Azores – most incredible volcanic features; Gruto do Natal and Algar do Carvâo. The latter being the only volcano in Europe to provide the experience about to unfold. 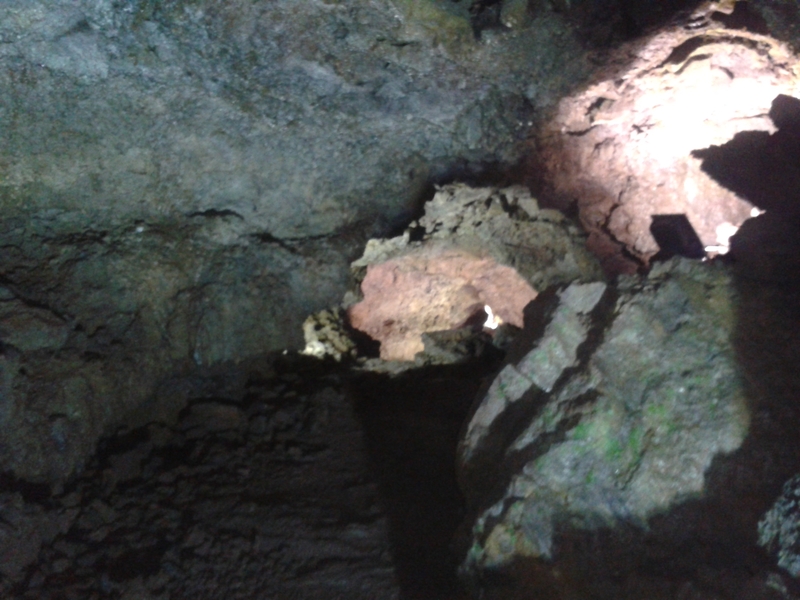 We began at Gruto do Natal ‘lava tubes’. Tickets are 5€ for the one cave or 8€ to include the second volcano Algar do Carvâo which is a short drive away. The journey into the tubes required hard hats and mind over matter for vague claustrophobes such as I. Our descent led to a blackened, rugged and alien underworld. 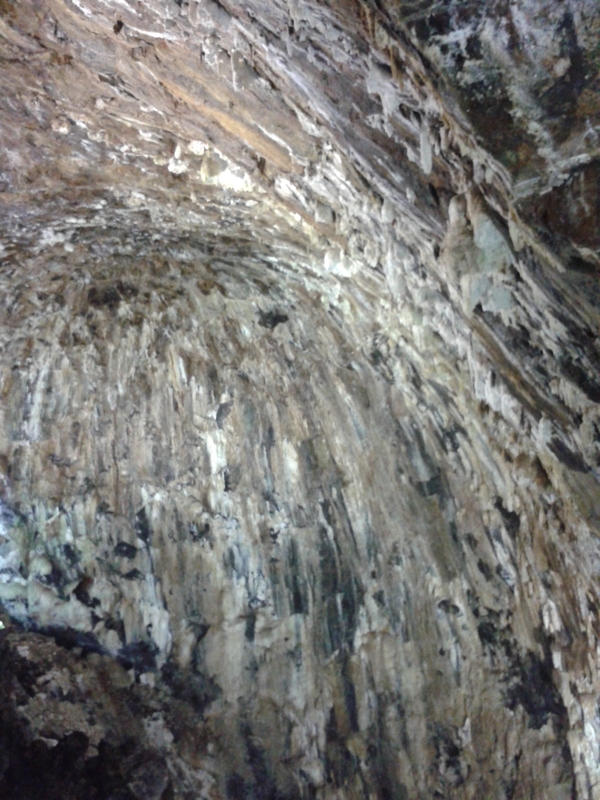 We found ourselves amid a junction of tunnels, created from lava having belted its way to the surface of the volcano, cooling sufficiently as it travelled to form a petrified crust and thus leaving a void or ‘tube’ for subsequent lava to travel through. At first, it would seem that underfoot, you are about to trudge your way through a mass of sludge. Then you realise it is literally rock solid. But it looks deceptively like dense mud (and appears wet from the natural moisture content of the environment) and you could be forgiven for thinking that impressions in the ground resemble thick tyre tracks. But here, every track, ridge and furrow has been formed by flowing, molten lava. At times, the tubes became a little low overhead, and we had to duck down considerably through relatively short distances of just a couple of meters. But nothing too arduous, and the routes were well lit with information points along the way. Evidence of the various stages of lava flow can be seen by contrasting surface layers of the tube walls. This truly was a completely unique and fascinating experience which I highly recommend. Our second subterranean volcanic journey was a couple of minutes drive away. Algar do Carvâo was indeed a contrast to our first. No hard hats were required but a journey down some 340 steps took us into the most incredible underworld of a cathedral-like chamber and a natural lake. It’s hard to describe this experience but it was as though we were descending into a scene from Dante’s Inferno – just that it wasn’t hellish. In fact it was heavenly. The far-away interior surfaces of the cavernous ‘cathedral’ chamber have such incredible and unusual depth, tone and texture that it almost doesn’t seem real, and that somehow instead, you are staring at an oil painting of gigantic proportions. But this is definitely real. Quite recently, there have been choir recitals here, as the acoustics within the volcano are apparently astounding, and that’s easy to imagine. By throwing your head right back and turning your face upwards towards the heavens, you find yourself gazing up through the modest vent of the volcano, bordered by dense, green vegetation and a reminder that life still exists above ground; it is easy to feel somewhat detached from reality in this deep, deep underworld. The vent was discovered some 50 years ago by a farmer, and first entered into in 1965 when some mighty brave explorers lowered themselves by rope into the unknown chasm beneath. Fortunately for us that they did, for what clearly transpired, was a discovery of immense geological importance and national pride. The lake at the base of the volcano is fed by rain water falling through the vent. In the summer, it is merely a couple of meters deep but in winter months it reaches levels of around 15 metres, with the record being 25 metres. Throughout the chambers, there are also some incredible stalagmites and stalagtites of amorphous silica – beautiful white formations that reminded me of moonstone. Climbing the steep steps back to the surface, I felt really quite emotional and not for the first time on this holiday. This planet of ours is a truly incredible thing, and experiencing fragments of such diverse geology while staying on these islands has been nothing short of a privilege. We’re nearly done on Terceira and sadly, the Azores! But a bit more to come….